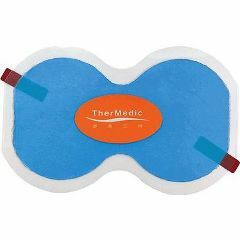 The Qi-Point Heating Pad is an ideal solution for the reduction of muscle spasms, muscle tension and joint stiffness. Thermal far infrared (FIR) technology penetrates deeper into the muscle tissue delivering nutrients and oxygen to cells, aiding in the removal of cell waste and promoting the healing process. The Qi-Point Heating Pad penetrates far infrared heat deep under the skin and can stimulate acupuncture points to relieve painful muscle tension and pain. The convenient heating pad can easily be applied to the body to promote healing from chronic pain or as preventative therapy. Specifications: · Temperature Ranges: · Low Heat -108 ºF · Medium Heat - 113 ºF · High Heat - 118 ºF · Pad Dimensions: 6.3" x 3" · Voltage: 5V · Wattage: 5.5W · One year warranty from date of purchaseHiPad ® Far Infrared Heating (FIR) TechnologyPenetrates deep into the muscles, dilates blood vessels and increases blood flow, delivering essential nutrients and oxygen to cells, aiding in the removal of cell waste and promoting effective healing.